The objective of my blog is to educate consumers. My goal is to introduce safer alternatives to everyday products, since many products on the market put our health, and that of our families at risk. I'm also all about product-discovery; when to splurge and when to save. I try to keep my blog varied as well as positive. I do not allow spam, or content on my site that isn't family friendly. 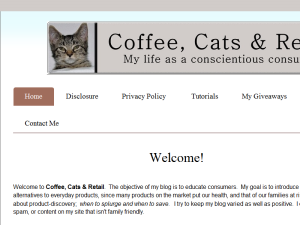 This what your Coffee, Cats & Retail Blog Ad will look like to visitors! Of course you will want to use keywords and ad targeting to get the most out of your ad campaign! So purchase an ad space today before there all gone! If you are the owner of Coffee, Cats & Retail, or someone who enjoys this blog why not upgrade it to a Featured Listing or Permanent Listing?